Regular pruning and spraying is advisable because of Dutch elm disease threat. 'Princeton' reportedly has excellent resistance to Dutch elm disease and is currently being planted. It was developed by Princeton Nurseries in 1922, which was about 10 years prior to the time when the Dutch elm fungal infection first came to the U.S. 'Princeton' typically grows to 50-70' tall. 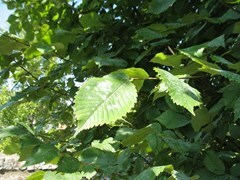 'Princeton' has reported excelent resistance to Dutch elm disease. It is susceptible to phloem necrosis which is a disease caused by a phytoplasma that attacks the food-conducting tissue of the tree, usually resulting in a loosening of the bark, wilting, defoliation and death. It is also susceptible to wetwood which is a bacterial disease that results in wilting and dieback. Various wilts, rots, cankers and leaf spots may also occur. Insect visitors include borers, leaf miner, beetles, mealy bugs, caterpillars and scale.